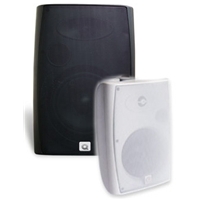 The objective for the designers of MS series indoor/Outdoor line-up was to take the compact wall mount speaker to a new standard of value and performance. The result is refined appearance, high fidelity vocal and music reproduction and easy installation/service. The MS Series all-weather loudspeakers are the ideal choice for supplying high fidelity sound for discreet indoor and outdoor applications. Their advanced polymer housing is designed to be acoustically inert and withstand harsh outdoor and maritime environments. Mounting hardware and grills are aluminum to drastically reduce corrosion. The vented cabinet design and high-compliance woofers generate realistic bass response in open air applications and the high-efficiency soft dome tweeters yield extended highfrequency response. Whether low impedance or 70/100 volt line installation, custom designed drivers and matching passive circuitry enables MS series indoor/outdoor loudspeakers to provide levels of vocal clarity and bass performance that substantially exceed their physical size.